Like many organisations, the ONE Campaign faces a challenge: to grow the community of people who engage with their online content, join their lists, and sign important petitions. But there’s a lot of content out there, and a lot of competition for people’s attention on social media. Our task as campaigners is to find ways to cut through the noise — and to do this, Forward Action has been working with ONE’s amazing team to launch 9countries.one.org. 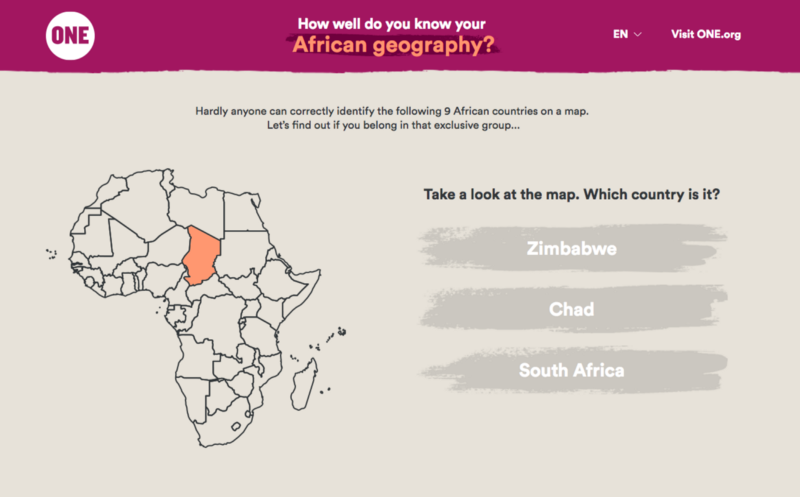 The idea behind 9countries.one.org is that we could use a fun, interactive quiz as a gateway to online activism. The challenge framing of the game — “Only a few people can correctly identify these countries on a map — are you one of them?” — grabs the reader’s curiosity and motivates them to click through to test themselves. We thought that this challenge framing — particularly for something like geography knowledge, where people often already have a sense of whether they’re “good at it” or not — would prove highly shareable, thereby bringing more users to the page. We used a structure we’ve tested on past projects to prioritise the share ask and, crucially, we embedded the all-important petition ask at a point where visitors were still fully engaged with the journey to encourage as many people to sign as possible. The campaign got results. This initial run was meant to be a test, so the paid promotion was minimal. But our theory that the content would be both highly shareable and an effective gateway into activism proved correct. 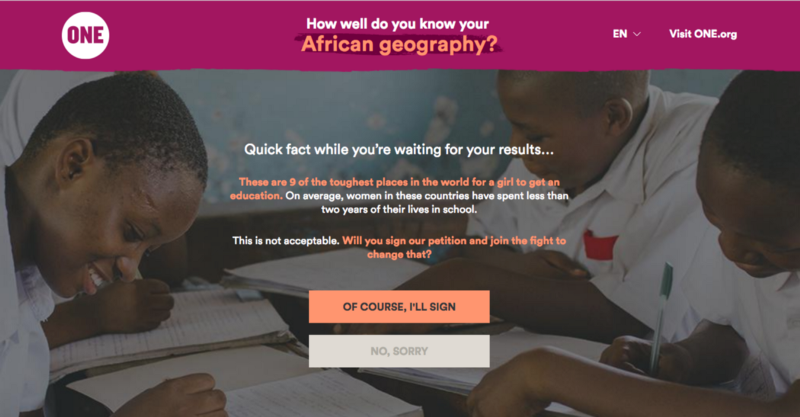 At the time of writing, 1.8 million people have completed the quiz, and 372,000 of them have signed the petition. We’re really proud to work with ONE. They’re using this petition to campaign for access to education for girls who, at the moment, are restricted to just a few months of schooling in their whole lives. Their wider efforts, supported by their 8 million members, are helping lift people out of extreme poverty all over the world. Their campaigns save lives, and we’re incredibly honoured to be working to help them. Before you go, we want to add one small PS. The idea for this whole project came from a junior writer on our team. We wanted to give her a shout out because it’s a great idea and she should be proud of her work. But also, there’s a lesson for all organisations: set up your workflow to ensure everyone has their ideas listened to. Everyone has smart ideas, but not every organisation is set up to make the most of that.